The story posted below uses images and words to help illustrate feelings of sorrow and confusion experienced by many women after a miscarriage. In my work with women and couples, I too have heard similar descriptions of feelings of loss, sorrow, and anger. Despite coming from people from different cultures and backgrounds, many personal stories of loss contain similarities. Here is one example from the story. The link at the bottom of this page will take you to the full story. The media tends to depict pregnancy as a miraculous time during which giving up the occasional glass of wine is the worst thing that could happen. And for the most part, it ignores one devastating, but very common, potential aspect of pregnancy: miscarriage. About 10% to 25% of all known pregnancies end in miscarriage, according to the American College of Obstetricians and Gynecologists. But the prevalence of miscarriages doesn’t mean that there is space to talk about it. While the internet has certainly given women a place to discuss many aspects of motherhood, oftentimes, there’s a taboo around the topic of pregnancy loss. Women who miscarry often feel withdrawn and depressed, or worried that the people around them won’t know how to react or what to say. They might even experience problems in their relationships as a result of a miscarriage. 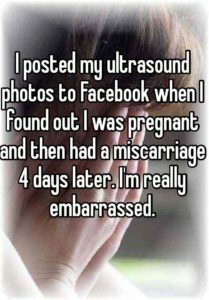 Ahead, we’ve rounded up 14 heartbreaking secrets, shared on the anonymous secret app, Whisper, from women who’ve dealt with miscarriages. The emotions described range from shame to guilt to embarrassment, but all of these secrets showcase the need to open up the conversation about this difficult subject. Just know: If you’re struggling through a miscarriage, you’re not alone — and there’s help out there if you need it.